The arrival of Loyalists during and after the American Revolutionary War placed pressure on the British Crown to find lands on which to settle the newcomers. 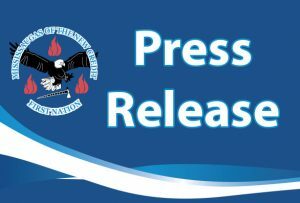 Among the Loyalists were approximately 2000 members of the Six Nations who had lost their homes fighting on behalf of the Crown. 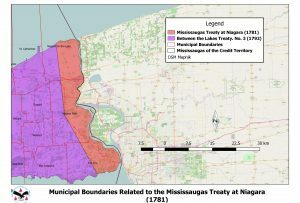 Seeking to reward his First Nation allies for their loyalty during the war, Governor Haldimand offered homes to the Six Nations refugees in the remaining British colonies. 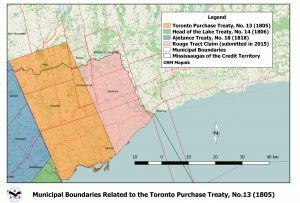 One group of the Six Nations Loyalists settled at the eastern end of Lake Ontario, while another group, under the leadership of Mohawk Chief Joseph Brant, selected the Grand River Valley as an area for settlement. 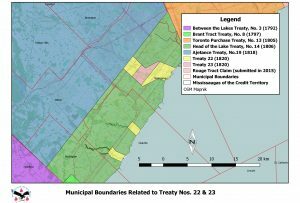 Recognizing that under the terms of the Royal Proclamation of 1763 the land needed to be purchased from its owners before the resettlement of the Grand River Valley could begin, Col. John Butler was sent to negotiate with the Mississaugas at the western end of Lake Ontario. 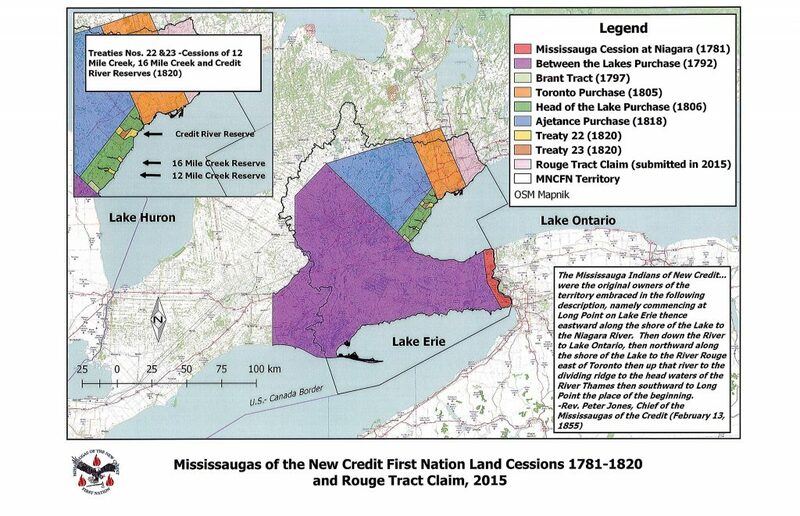 On May 22, 1784, for the sum of £1180 worth of trade goods, the Mississaugas of the Credit ceded to the Crown approximately 3 000 000 acres of land located between Lakes Huron, Ontario, and Erie. 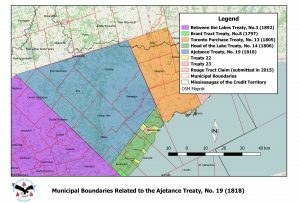 Of the land ceded, some 550 000 acres were granted to the Six Nations in the Haldimand Proclamation of October 25, 1784, with the remainder to be utilized for the settlement of other Loyalists. 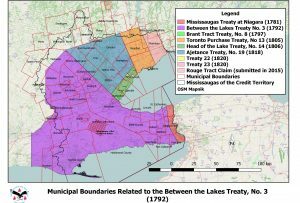 The land grant to the Six Nations was to extend six miles on both sides of the Grand River from its mouth to its source. 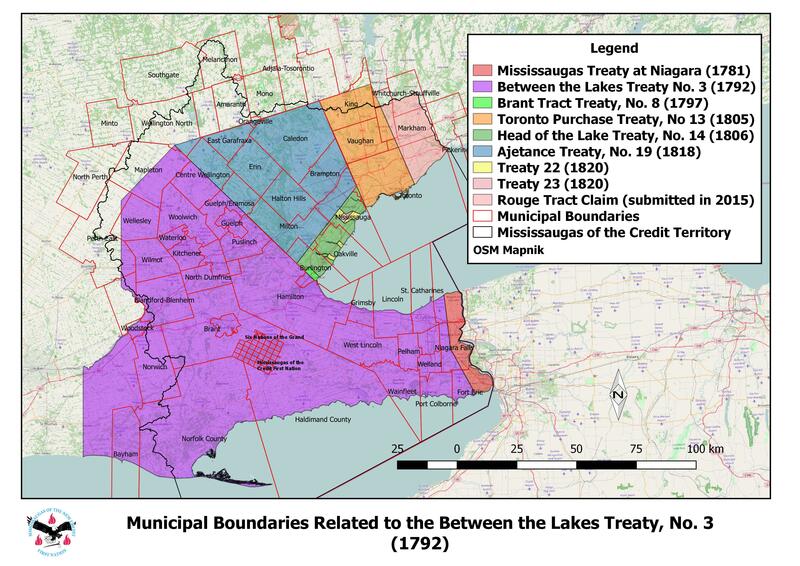 When it was later discovered that the upper limits of the Between the Lakes Purchase were in error due to faulty geographical assumptions, actual boundaries were defined and a confirming document signed by the Mississaugas and the Crown in 1792. 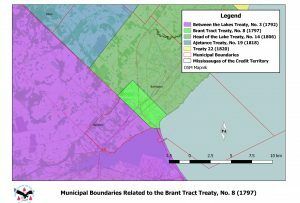 Major population centres found within the boundaries of the Between the Lakes Purchase include Hamilton, Cambridge, Waterloo, Guelph, Brantford, and St. Catharines. 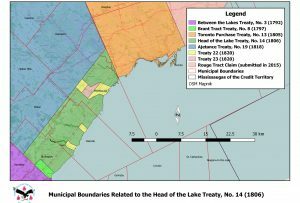 The present location of the Mississaugas of the Credit First Nation Reserve is located on Between the Lakes Purchase lands.